Computer donations to the school are appreciated. However, getting rid of the old equipment is challenging. A monitor donation! Thank you very much! Our school just received a computer donation from a local company who is updating their equipment. We now have 20 (gently used) 17″ flat panel monitors. The equipment is clean, in great working order, and includes all the power cords and video cables. This is AWESOME!! I thank the donor for the equipment and start to load as many flat panels onto my utility cart as I can carry. My plan is to replace the old CRT monitors that weigh about 50 pounds each and take up considerable real estate on the teacher’s desk with the new equipment. This is AWESOME!! I immediately get to work swapping the outdated equipment with a sleeker model. I soon discover that lugging each of those old monitors around is back breaking work, literally! They are so heavy! However, the effort is worthwhile. Each monitor has built in speakers and takes up hardly any room on the desk. The teachers are so pleased because now they actually have room to work. This is AWESOME!! 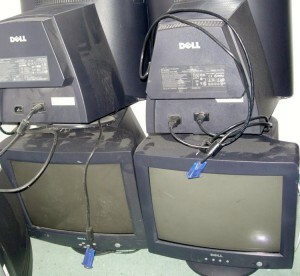 I have been piling the old CRT monitors in the computer lab. They are shoved below the desks and stacked all over the office. I look around at my computer graveyard. I have old equipment everywhere and no one wants this dated technology. Getting rid of these boat anchors is not going to be an easy task. This is NOT AWESOME!! First I offer them for FREE to anyone who is willing to take them away (hurt their back). No Charge! Take TWO!! Please! Surprisingly a few of them do vanish this way, but I still have the majority taking up space in the computer lab. I start to consider my options. If I take them to the garbage dump I must PAY a disposal fee. Not only is this going to be expensive, but I have almost 20 heavy monitors that will never fit into my little car. It would take me at least 5 trips to dispose of them this way and the truth is that even if this were a realistic option, the school cannot afford to get rid of them. The next option I explore is to check with the manufacturer. I hope that if the school paid a recycling fee when the units were purchased perhaps they might take them back. However, I discover that the old CRT monitors were donated a few years back and they cannot be returned to the donor, nor the manufacturer. I then investigate if I can drop them off at the reuse center. Unfortunately, they don’t want them either. Apparently, it is their policy to only take monitors manufactured after 2006. I stand in the computer lab, surrounded by CRT monitors, frustrated with my predicament. I then have an idea. I call my local Staples, which is an office supply store. Staples is part of the Ontario Electronic Stewardship Program. The company places a strong focus on environmental responsibility. Success! Staples will take them. However there is a limit of 3 monitors per person, per day. I’m going to have to find some volunteers to help me out, but at least there is no fee for disposing of them. This is great news because the school has a limited budget.